When it comes to SEO, anything you can do to make the content on your website more easily understood by search engines will be beneficial. As well as making sure you adhere to general SEO best practices, there are a few steps you can take to optimise your code with context, thereby giving Google the extra opportunity to properly assign your content to the search query. So, if you have a website full of different bits of information – dates, times, ingredients, names, or anything that fits into a grouping – you can categorise it so Google knows exactly what the information is and where it can be best delivered to match a search enquiry. Basically, schema markup is a form of structured microdata which itself composes of a set of tags that annotates information within your HTML code. It is a type of semantic vocabulary created jointly by the big search engines in 2011. Google, Yahoo, Bing, and Yandex came together to define a universal standard for this structured data. If we think of structured data as the language, then schema.org gives us the vocabulary. So, what is it actually used for in terms of SEO? The anatomy of a search engine results page (SERP) changes all the time. 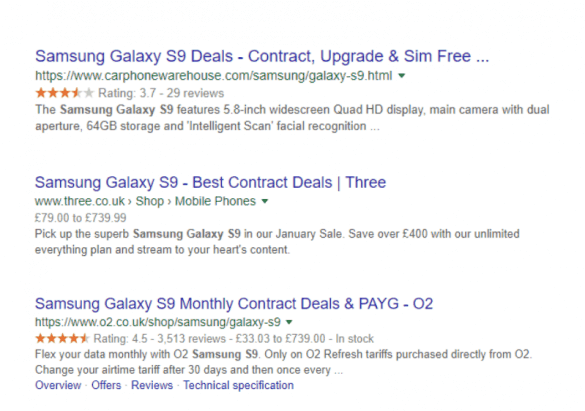 One element seeing increased use is called a rich snippet, which is a box situated at the top of the SERP containing useful snippets of information that showcase the most relevant answer to the search query. Although there is no real evidence for microdata’s positive effect on organic search, the presence of rich snippets adds both authority and trust to the website that delivers it, as well as enhancing visibility and potentially click-through rate. What Kind of Websites Use Schema Markup? Really, any website can benefit from structured data and markups. There are a number of elements that can be marked up in this way. 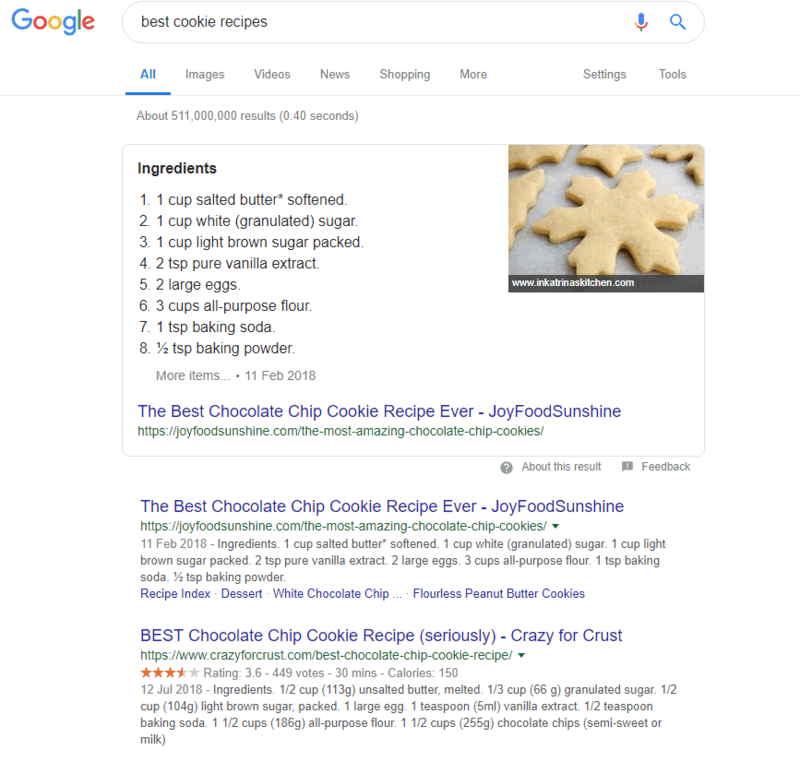 For example, this website used schema to tell Google that each ingredient was part of an overall recipe, therefore allowing Google to display the recipe in its entirety in the SERP. This website was able to tell Google not just what the data is but also what it actually means, giving the content some context. There are literally hundreds of markups to choose from, including names and addresses, products and prices, lists, articles, events, opening times and many more. However, in spite of the breadth of options available, only a very small percentage of websites are actually utilising structured data, giving your business the opportunity to capitalise and bridge the gaps. What Kind of Things Can Be Done with Schema Markup? With this kind of markup, you can showcase event calendars including dates, times and locations of events. We’ve all watched a movie and thought “I wonder what else she’s been in…”, well the carousel markup shows a wide range of choices specific to your search. Searching for ‘Julia Roberts movies’ gets us a carousel of information. Video is the go-to content method for many these days, and video markup can push your chances of getting a top spot on the SERP. 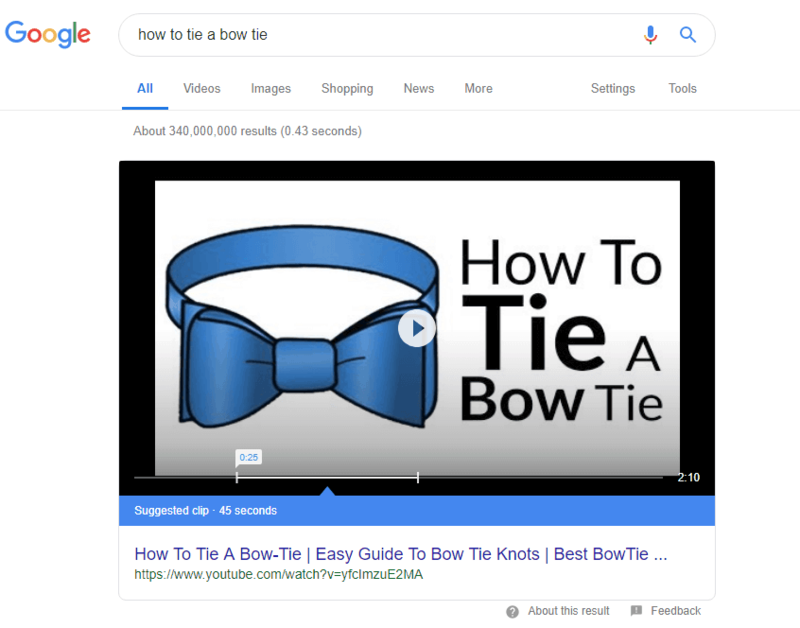 Often, these videos answer a question, so for this search we looked at ‘how to tie a bow tie’, and we were delivered everything we need in one video. 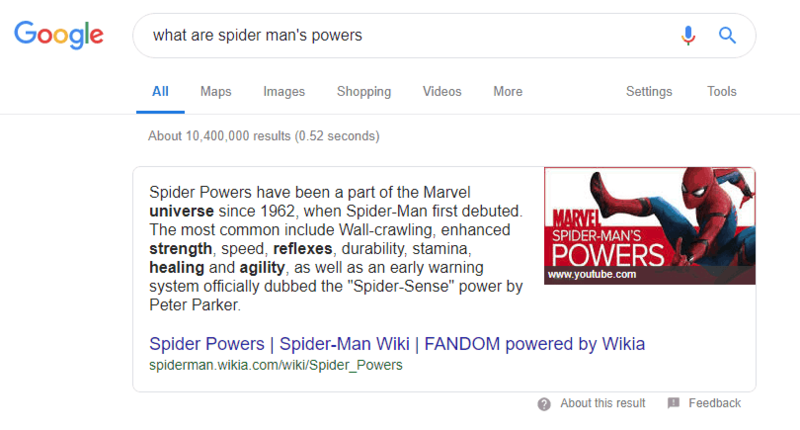 The coveted rich snippet is content that has been marked up to answer a specific question or search query so for our question about Spider Man’s powers, we get a to-the-point answer from a reputable site. How Can Schema Help Your Ecommerce Website? As we mentioned before, there is no set evidence that proves schema markup’s worth in terms of direct influence, but it is clear that the indirect influence is become invaluable. For ecommerce websites, the value is found in the increased click-through rate and enhanced customer engagement. The results above are for the search term ‘Samsung Galaxy S9’ and demonstrate range of schema markup in use. Reviews, price, internal website links, availability, and breadcrumbs all help the actual result put across the most possible information to the customer. There are two different formats you can use to implement structured data for your website – microdata, RDFa, and JSON-LD. If that just looks like a bunch of letters, let’s try and dispel any confusion. It is very important to test your mark up before implementing it in order to be sure it will appear as you intended it to on the SERP. There are several ways you can test your structured data, but the most widely-used free tool comes from Google itself and is imaginatively named Google Structured Data Testing Tool. It gives you two ways of approaching your mark up – you can either input a URL to check what might already be marked up on your website, or you can input the code directly in order to see how it appears to Google. The first option – Fetch URL – will demonstrate how Google perceives the existing structured data on your website, including any errors that might need fixing. Or, you can select ‘code snippet’ and enter your markup code to see how it will look. This below example is a recipe for banana bread, with the code snippet on the left and its corresponding result on the right. Google’s Structured Data Testing Tool gives you an opportunity to play around with the code to find the best way of showcasing the many bit of information on your website. 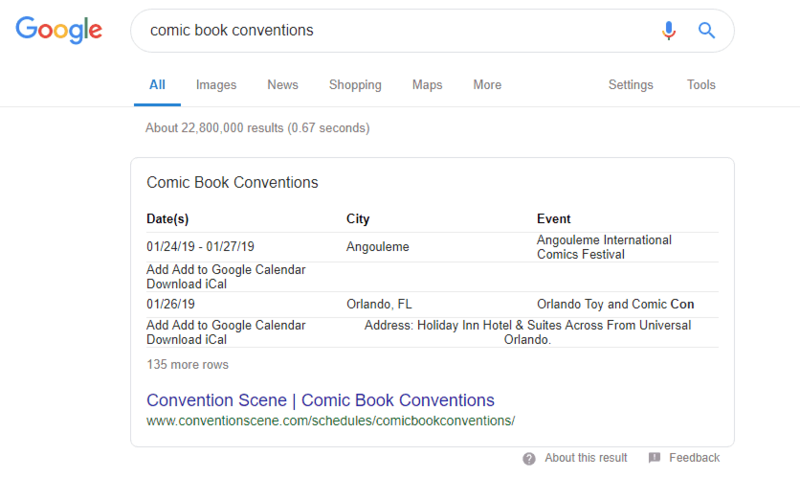 You can drill ever deeper into schema to find more interesting ways to push your content through the ether to the SERPs valuable rich snippet area. With so much content on your website, why let it go to waste when there is every chance a few changes to the code could help elevate your whole website to new audiences? Your website matters a lot. The performance of your business is often directly link to the effectiveness of your website in reaching the right audience and encouraging conversions.